I learned via The Paris Review that yesterday, in 1925 was the day Mrs. Dalloway by Virginia Woolf was published. I love that character and the book. I knew I had to paint her for my book Well-Read Women: Portraits of Fiction’s Most Beloved Heroines. There were so many good Clarissa Dalloway quotes to choose from but I chose: “What a morning—fresh as if issued to children on a beach”. I find it so evocative. 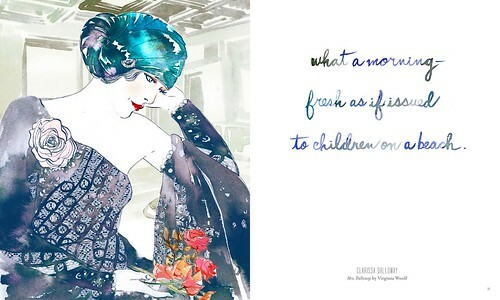 You can get a framed limited edition print of my portrait of Mrs. Dalloway and that lovely quote here. Wow this is just gorgeous. I also love the book design and the big hair girls in your last post. Congrats on the book!